Green Drinks is back in time for the holidays to lend a helping hand with your shopping on Wednesday, Nov. 5, at the Yellowhead Brewery. We hope to see there, so please consider our . . .
We all know the value in shopping locally — the boost to our economy and confidence placed in our local community. However, you may be surprised by the diversity of business, skills and items you can get locally. Check out the featured guests here. As a special bonus due to our generous local friends at Rapid Fire Theatre, The Dish and Runaway Spoon and Earth’s General Store, all of our guests will receive one or two gifts from the aforementioned businesses! Hurrah! We have some spiffy prizes to give away from many local businesses. Check out the fantastic list here. 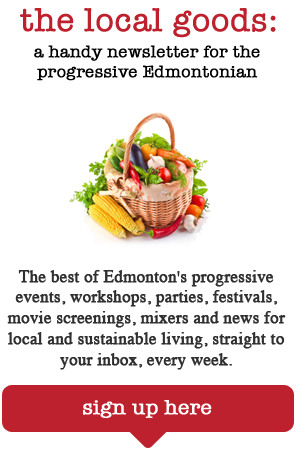 Come share and discover gift ideas with other progressive Edmontonians! Check out #yegsanta for inspiration. Every attendee will receive their own letter to #yegsanta as part of this Green Drinks: Shop Local. By completing your letter, not only will you get in on door prizes and compete in a Twitter contest (double the chances to win! ), but it’ll also get you mingling with Edmonton’s finest in one of Edmonton’s coziest bars. 5. We will miss you! This is the last Green Drinks of 2014. Our next gathering is Wednesday, Feb. 4, 2015! We’d love to mingle and enjoy an evening with the fantastic community we’ve come to know and love one last time this year!